Is this the back and sides of the new iPhone? The iPhone repair experts at iFixyouri have forwarded a nifty new part that entered their catalog. 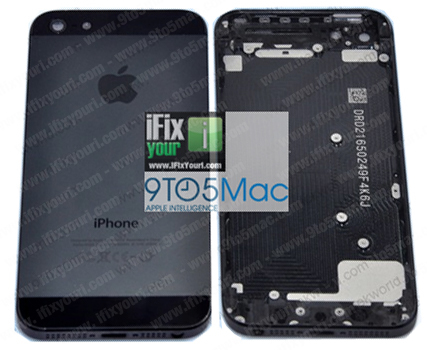 It could be the back plate for the upcoming new iPhone or one of the early prototypes. We are told the Chinese parts supplier is a reliable one (not a fly-by-night) and that they are actually selling these parts (do not worry, we have one on order). From what we can see, the part does follow a lot of the rumors and speculation. For instance, you can see the smaller dock connector at the bottom and it appears thinner overall. We are told the extra space on the bottom is used by Apple to enhance the speakers that will be louder and of a higher quality than the current iPhone. The supplier said the back plate is just one piece anchored by an aluminium alloy (not liquidmetal). Interestingly, the supplier also told iFixyouri that black and white would not be the only two colors this year. There were at least two other colors seen for the back plate that obviously might not make it into production if these parts are indeed real. Normally, we would scoff at such a notion, but these same parts suppliers were the first to deliver the news that the iPad would come in white.